What is the proper way to measure 0-240v 50-60hz Mains AC with an arduino / 3.3v mcu? I've been researching the webs through so many ways to accomplish this, from octocouplers, mid400, LM2902N, tl081, voltage dividers, transformers, etc.. for a production product I have in mind, but I haven't ended up an any clear solutions. I'm hoping to get a clear sense of direction. I'll leave this at the basics and provide more info needed. Smallest form factor possible. Unit is handheld & battery powered, so prob not enough room for transformers. cEMa is a new contributor to this site. Take care in asking for clarification, commenting, and answering. Check out our Code of Conduct. At these high voltages, I don't think that you will find many "off-the-shelf" options for voltage measurement via Arduino or a similar ecosystem at the usual suspects (Sparkfun & Adafruit). However, you can fairly easily assemble your own circuit for this with a small number of components. First, a measurement transformer is needed to reduce you (very high) AC voltages to something lower that the Arduino or other MCU can deal with. You will need to do your own search to find a transformer with a turns ratio and isolation voltage that meets your requirements (for example a 100:1 turns ratio transformer would reduce your 600 VAC to 6 VAC). Transformers above 600 VAC are tricky to find based on a quick search. 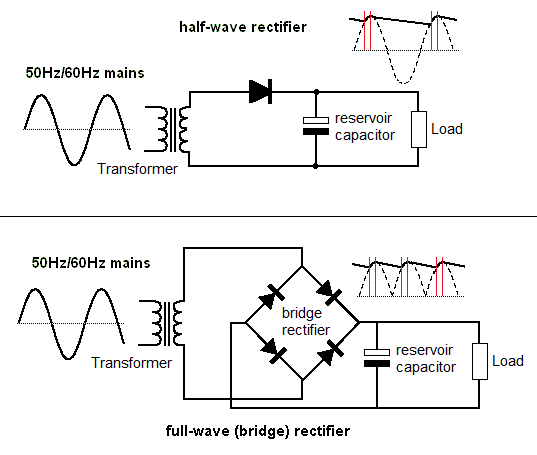 A large reservoir filtering capacitor is used to 'smooth' out AC half wave to a 'DC' voltage (approximately, there is still some fluctuation dependent upon the capacitance used). A capacitor value of 100 uF seems pretty common. This signal could be additionally filtered, scaled by a voltage divider to a different DC voltage of interest, etc. In your case, if below 5VDC, it can be measured directly by the Arduino UNO or similar ADC (analog-to-digital converter). 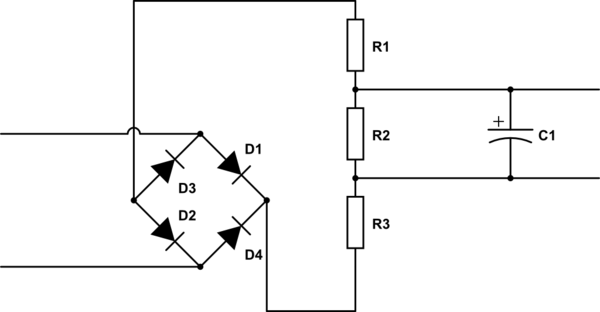 Try to combine both solutions - bridge rectifier and RC-filter combined with voltage divider. Although your device is handheld and powered from internal battery using triple resistor divider will no cause 'common ground wire' problem. Only errors of measurement. Because you are talking about meassuring of AC Voltage - there will no be 'reverse polarity' problem. cEMa is a new contributor. Be nice, and check out our Code of Conduct. Not the answer you're looking for? Browse other questions tagged arduino pcb-design adc mains esp8266 or ask your own question. How to tell if mains voltage is on with microcontroller? Where can I learn to safely deal with mains electricity?